Gathering in a 13th Century building, extensively restored in the 19th Century, the congregation is a vibrant one ranging in age from babes in arms to ninety year olds, worshipping in many different styles from traditional BCP services through to contemporary lay-led celebrations. Visit us on Facebook or TripAdvisor. 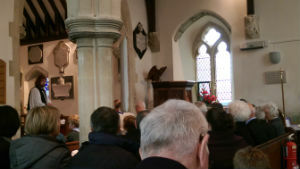 Our ecumenical links with the Methodist Church are very good and representatives from the two churches meet regularly to plan joint services and events. Car parking is 100 metres from the church through The Rectory entrance pillars on the right. A ramp is available to get up steps at the entrance to the churchyard. There is a toilet in St Martins Community Hall.